It’s unfortunate that one unflattering photo can cause some people to run rampant with pregnancy rumors. 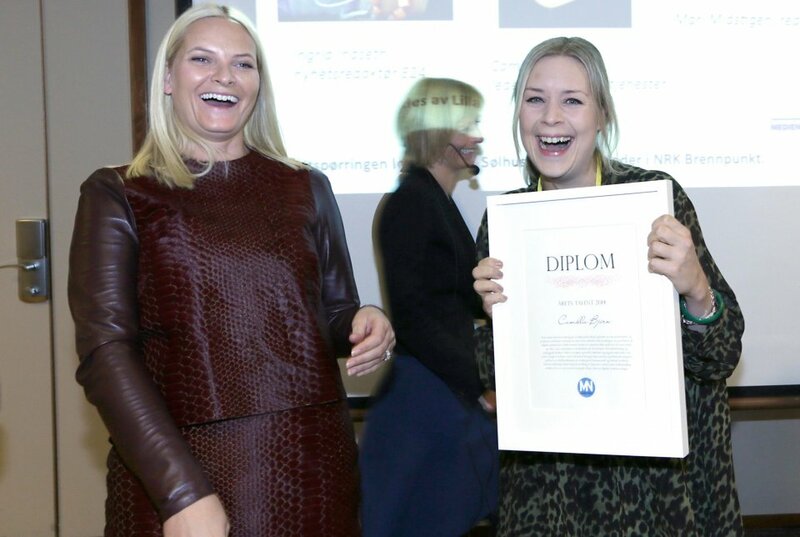 BUNTE.de did just that yesterday after Crown princess Mette-Marit was snapped in a less than stunning photo (above) on Friday while presenting a 2014 Talent Award. Do I think she’s pregnant, though? No. I think we all can point to a picture of ourselves we have untagged or deleted for being less than flattering. Unfortunately, Crown Princesses don’t get the chance to scrub their Facebook’s like we do. She has a knack for picking and wearing clothes that don’t always fit her body type, and like most of us, has probably put on a few pounds over the years. Add that to a photo shot from a bad angle and a rumor starts. I have seen photos in the past of super models who are super skinny and they look fat. If a phot is shot from the ground up and the outfit is this unflattering, it won’t end well. Heck I have even seen pictures where Kate Middleton looked bulky before she was pregnant. One bad picture can start an avalanche of press speculation. She may be pregnant and she may not, but if she is we would know eventually. She does need to ditch the outfit though. Yuck. She doesn’t look pregnant, she looks fat, and she is’t fat. She needs Tom imd the photographer and smack him a good one! That picture is just plain mean. l dont like it when kates name is mentioned with other royals,kate is lazy and has cheapend the BRF! !